Hi, Sarah here, a good friend of Miguel’s. I read part Luigi’s Legacy that you wrote! Cuisine Miguel is a culinary experience that you will never forget and will leave you happy and more than satisfied. Each course delivers sensational flavors and will literally have you begging to know what’s in there that makes it taste so good. For anyone who meets Miguel, it’s no secret that it’s a combination of culinary creativity, impeccable attentiveness, and a warm heart that creates a memorable evening and all around good time. Here Marco writing from the cold Spain! How are you doing??? Hope you have loads of new guests!! Now I´m going to describe the 6 days I passed in Miguel Cuisine. My two friends and I found MIguel Cuisine by chance searching trip advisor and we probably passed THE BEST 6 DAYS OF OUR MONTH JOURNEY IN COSTA RICA. The place is awesome, 30m to the amazing beach, clean, beatiful and big rooms in a very low price. Miguel and Sarah are so nice, they will make you feel as if you have been living there for years!!! And finally don´t forget to try the amazing food made by MIguel, that´s GREATTTTTTTTTTT!!! DON´T DOUBT AND VISIT SÁMARA AND STAY IN CUISINE MIGUELL!!! My best wishes and kissesss from Spainnnn!!! Sarah and her son Jack were very welcoming hosts. Miguel was out of the country so we didn’t get a chance to meet with him, but heard many great things about him. The house was in a very good location for us, not too close to the center of town, but just far away as to not hear the busy nightlife. They have a wonderful kitchen which we were able to use and a mini fridge in our room to keep food fresh. We stayed in the bigger room right next to the back patio. It was a lot bigger than the pictures showed and the bathroom was clean and the shower had hot water. I came for surf, which Samara doesn’t have much of, but we had a rental car and were able to drive to some really nice beaches to the south. One of them was Playa Camaronal which is about 30 mins south and had decent waves. It’s also a wildlife refuge and turtle sanctuary. There was definitely a more community vibe associated with the place, so if you’re looking for more of a private retreat you may want to try a resort or hotel in the area. If you want a community/hostel feel then this is the place for you. Thanks! Wonderful visit to beautiful Samara, and with lovely host Sarah! Everything was perfect, and as advertised. Sarah was very generous with suggestions and recommendations. Our time in Samara at Cuisine Miguel felt like a visit with an old friend. Thank you Sarah! Very warm welcome. Nice talks with Sarah about living abroad and Costa Rica in general. Ocean right in front of you for a nice surf sessions ( 14:30 begins high tide. Only possible wave for samara) of midnight swim. 🙂 fresh coconuts from the palm threes in the garden which we could open with the machete of Sarah’s son. So, great place to stay for a good price! We loved Miguel and Sarah!!! Oh and Jack:) This was such a great place to stay. The pictures were true to what we stayed in. It was right on the beach, which was great. Very close to town, just a short walk down the beach. They made us feel totally welcome and a part of the family. We never felt as though we were in the way or a bother to them. They were very accommodating and were willing to help us out with directions or recommendations for food and things around town. They just added a new addition to their family, a little puppy, Angel. She is just too cute. They invited us to have dinner with them on a non Sunday and it was great, Miguel is a fabulous chef. Miguel also plays guitar very well, so we sat on the porch and just listened. This was really the best place to just chill out and relax. They have a big table on the back porch, chairs, and a hammock; awesome place to just hangout, and we did! Whenever we go back, this is the place where we will stay. If you are looking for a chill spot on the beach and great people to host you, this is it. You will love it and them! was,traveling alone to Samara. As,I was nervous to travel alone, before I even left for my holiday, Sarah and Miguel made me feel very comfortable. They walked me thru my travels step by step. When I arrived o was welcomed with open arms….all of the family is a special kind of wonderful ♡ Their place is wonderful. Right on the beach with a large patio to have meals and hang out at night. They are so welcoming. Jack, their 15 yr old son took me along with him to Easter service. Then, Miguel made an awesome Easter dinner for myself, his family and neighbors. I felt like family thru my stay and still do. Who does this?? Thoughtful wonderful people fo this! I love my room. It had its own bathroom. It was very roomy. I could hear the waves at night and witnessed the wild horses every morning walking thru the yard. So peaceful. I can’t thank them enough for their hospitality and friendship thru my stay. They will always be my friends. My friend and I stayed at Miguel and Sarah’s for three nights and they made us feel at home. They gave us a key and showed us where we could lick up valuable things, we used it not that I felt like anything was really in danger of being stolen but for peace of mind that is nice that they provide that. We got to be there for one of their dinners. Miguel is a phenomenal chef. It was a four course meal and each plate was amazing. They are so welcoming and helpful and just wonderful hosts and people. I am honestly going to miss this family. The location is perfect, right on the beach close to restaurants and shops and stores. We had rented a car but decided things were close enough to walk to so we returned it early. We were in Samara in March which was very hot but the ocean is right there to cool off in. You won’t regret coming to beautiful Samara and staying with these lovely people! Staying with Miguel, Sara, Jack, Mango, and Flo was one of the best parts of our stay in Costa Rica, and they made us feel very welcome. 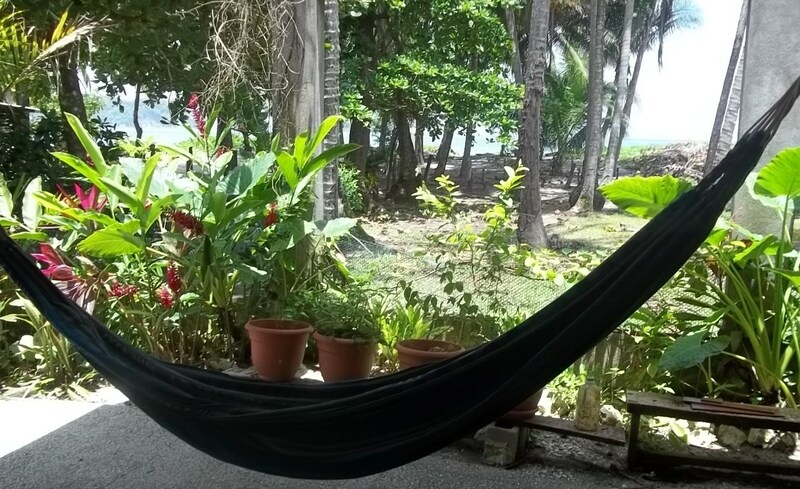 Delicious coffee in the morning was enjoyed on the front patio or in the hammock with the soothing sound of the ocean. It is literally a one minute walk to the beach and it is further away from the resorts/hostels so it is very secluded and quiet, but also is very easy to walk to the surf rentals and bars if desired. We mostly just wanted to relax and that’s exactly what we did. Sara gave us the tip to see the nearby crocodile river one day and let us ride their bikes there. Howler monkeys swung from their trees twice a day (very early in the morning and later in the afternoon) but were only heard if you were already awake. They house is about a 10-15 minute walk from a delicious vegan restaurant, and the kitchen was more than ample for our cooking needs. The bedroom was spacious and had more than enough room for our belongings. It does get hot, so thankfully Miguel and Sara gave us a strong standing fan to help cool down along with the ceiling fan. When we weren’t swimming or sunbathing it was nice hanging out with Jack, who taught us how to play Backgammon and enriched our lives with ridiculous Youtube videos, or chatting with Miguel and Sara about their travels and experiences. So my lovely hosts, Miguel, Sarah and Jack saved both of these dogs from a miserable life. Angel has been with the family for about 6 months. Luna was adopted the 2nd nite I was with them. Luna’s name changed from her given name which for the life of me I can not remember, to Gypsy. Then Leona and Anna, the house guests from Germany said that Gypsy had kind of a negative meaning in Germany. So then it changed to Luna. It was a full moon recently so it seemed like it fit but it did not stick. We called her no name for a while. Then we were all throwing names out and I said how about Lilly? Jack loved the name and by morning this name stuck. Lilly 🙂 Silly Lilly will always hold a special place in my heart. So special that they even gave her my same birthday because they did not know her exact birthday but knew she was about 6 months old. So Lilly and I share a birthday now. February 24th. Thank you again Sarah Barkley and family for a most memorable time in your home.